When last we set our sights on the increasingly crowded field of iPhone air hockey games, the feedback we received both in e-mails and forum posts had an air of unanimity that one rarely finds on the Internet. How on earth, the multitudes asked in a voice as one, could we have overlooked Touch Hockey: FS5 from FlipSide5? It was, in more than one reader’s opinion, the finest example of an air hockey game in the App Store and the fact that we hadn’t rated it was merely more evidence of the fact that our collective heads were lodged… well some place that would severely limit one’s visibility. Face Off: Touch Hockey: FS5 on the iPhone blends an authentic air hockey look and feel with a realistic physics engine to create an enjoyable game. The truth is, of course, that there are a lot of mobile apps out there—I’m pretty sure a couple dozen more just landed on the App Store in the time it took me to write this sentence. And while we try to review as many apps as possible, sometimes, an app just has to wait its turn. Today, it’s Touch Hockey’s turn—along with several other air hockey games for the iPhone, iPod touch, and iPad. Touch Hockey partisans can at least take comfort in the knowledge that they’re right when they say that this game, designed for the iPhone and iPod touch, is on the short list for the top air hockey game in the App Store. Touch Hockey feels like an arcade air hockey table shrunk down into mobile form. From the clink of the mallets against the puck to the hum of air from the rink itself, this app faithfully recreates every element of the air hockey experience. The game also boasts a realistic physics engine—the puck moves and ricochets like you would expect it to, making for some satisfying gameplay. You can compete in single-player mode against a fairly adept computerized opponent, widening and narrowing the goal size to adjust the degree of difficulty. (In fact, you can set different goal sizes for you and your opponent just to add—or remove—an element of challenge to the game.) You can also face off head-to-head with a human opponent, either on the same device—you play on one end while your opponent plays the other—or via a Wi-Fi or Bluetooth connection. I was able to get a two-player game going wirelessly, though the action wasn’t always smooth—sometimes the puck would jump to another part of the rink, making defense a little more difficult than it needed to be. (In fairness to Touch Hockey, this issue also occurred when testing wireless two-player features with the other games reviewed here that offer this capability.) If you’re hankering to throw down against a flesh-and-blood opponent, my advice is just to play on the same device; even with the iPhone’s compact screen, you won’t really get in each other’s way. On Fire: The puck lights up in this best-of-five Arcade Hockey match to let you know the next goal decides the game. While it’s a nice touch, the rest of the app is pretty plain. Touch Hockey lets you play games to five, seven, nine, or 11 points—you decide in the game’s settings screen. You can also turn a replay feature on or off (opt for off—it really doesn’t add much except for more time to your game) and adjust the realistic lighting for the rink. The free version—Touch Hockey: FS5 (Free)—offers the exact feature set as the paid version, only with an advertisement that appears after you’ve been playing the game for more than few minutes. The ad is pretty intrusive by the standards of mobile advertising; better just to pay the $2 to be rid of it. 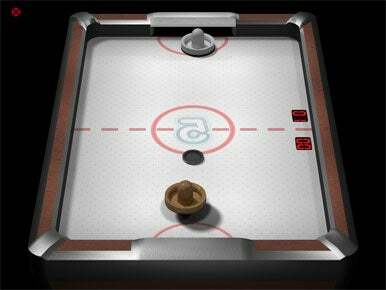 As realistic as the gameplay is in Touch Hockey, other air hockey offerings do a better job of providing a more enticing variety of options. Arcade Hockey from Brainjuice, for example, offers two different modes—a best-of series, in which you try to best your opponent in the majority of five, nine, and 15 face-offs, and timed, in which you try to score more goals than other guy in two-, four-, and six- minute games. These two different modes feature several clever touches. In a best-of match, the puck will begin glow if you and your opponent are tied heading into the decisive point (knotted up at two points apiece in a best-of-five match, say). In the timed game, the puck doubles as a clock, with a hand sweeping its way across the face of the puck as time ticks down. Both games are playable in single- or two-player mode, though there’s no ability to connect to another player wirelessly; you’re playing on the same device. Note that these options are limited to just a best-of-five match and a two-minute timed match when you download the free version of Arcade Hockey. To unlock the other modes and to gain the ability to adjust the difficulty level, mallet color, and puck size, you’ve got to pay $1 via an in-app purchase. Perhaps some users will enjoy the free version despite its limitations, but to me, the $1 purchase was necessary to get the most out of Arcade Hockey. That’s because apart from the added gameplay options, much of Arcade Hockey feels ordinary. The graphics are serviceable but not certainly not stylish, and the sound effects, while decent, don’t add to the experience in the way Touch Hockey’s detailed audio does. 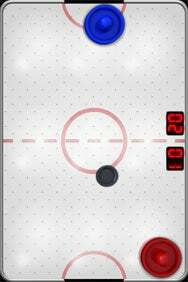 Arcade Hockey offers niceties such as OpenFeint integration and the ability to control music stored on your iPhone or iPod touch from within the app, but the end result, while decent, doesn’t measure up to the other offerings here. ... unless you’d rather use Glow Hockey’s customization features to give the playing surface a different look. Glow Hockey 2 goes in the exact opposite direction of realism. The rink is surrounded by multi-colored panels, the puck is an orb of light, and your mallet is a glowing colored disk. Smash the puck into a wall, and the wall glows while multicolored sparks fly. The sound of the puck hitting the mallet has an unearthly though wholly appropriate echo to it. 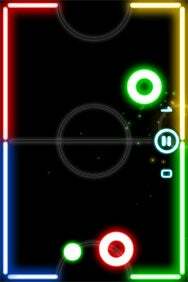 It feels like something out of Tron, if Flynn and Sark had decided to do away with light cycles and settle their differences with a relaxing game of air hockey. 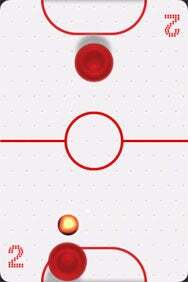 Glow Hockey doesn’t offer many gameplay options—you can play to any score you like, so long as it’s seven points. But it does offer options for tweaking the mallets, puck, and playing surface. In addition to variations on the game’s space-age look, you can also make your rink resemble a conventional air hockey table or even a soccer pitch. 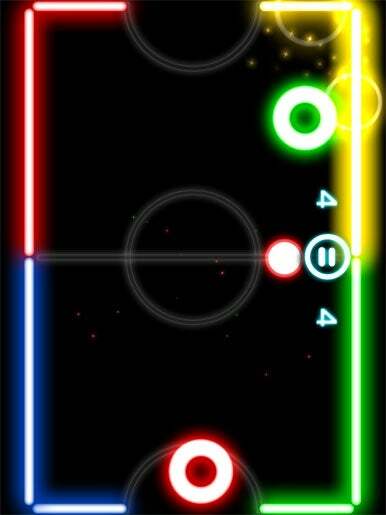 Super-Size Me: Though it’s an iPad-optimized game, Glow Hockey 2 HD is simply a blown-up version of the iPhone game. With its bright colors and unique look, Glow Hockey 2 is futuristic fun, so much so that I’m able to overlook the fact that its physics engine can be a little frustrating. The puck is prone to glancing off my mallet in unpredictable ways, launching where I want it to on some occasions but heading sideways on others. The end result? I’m threatening Wayne Gretzky’s scoring record with the number of own-goals I’ve tallied. Still, when I’ve got my iPhone, I find myself reaching for Glow Hockey 2 more often than I do Touch Hockey, if for no other reason than the challenge posed by the former’s Championship mode. For iPad-optimized games, however, the situation is reversed. Glow Hockey 2 HD is an exact feature-for-feature recreation of the iPhone game, to the point where if you’re not playing close attention, you would think you’re simply playing a blown-up version of the iPhone offering. (The HD version, obviously, looks a little sharper than the iPhone version running in 2x mode.) That’s all well and good—Glow Hockey is a fun game on any platform—but given how inventive the iPhone release was, it’s a little disappointing not to see the developer do more with the iPad’s larger screen real estate. View From the Side: In its iPad form, Touch Hockey adds a new view and the ability to play in landscape mode. Landscape mode may not seem like a big deal to some users, but I find it’s more comfortable to hold the iPad that way, and I like having the option to play Touch Hockey in that orientation. (The game continues to support portrait mode as well.) And I really enjoy having the option to switch from the standard top-down view to the more angled view Touch Hockey Extreme bills as “3D.” I find it easier to handle my virtual mallet this way, and the view is closer to one you’d have standing at an actual air hockey table. Touch Hockey Extreme also has an Auto mode, which switches between the top-down and angled views depending on how you tilt your iPad, but I found switching back-and-forth distracted me from my game; I simply opted for the 3D view in the game’s settings and settled back to enjoy the air hockey action. On the iPhone, Touch Hockey and Glow Hockey 2 are pretty evenly matched. I tend to enjoy the latter more because of distinctive look and feel and the challenging Championship mode, but I wouldn’t hesitate to recommend Touch Hockey to iPhone gamers who place a premium on realism. On the iPad, though, Touch Hockey Extreme clearly has the edge—FlipSide5 took an already great game and tailored it perfectly for Apple’s new device.